† indicates evidence of time travel: the 2011-08-11 and 2012-08-20 data files each have an extra line of data at the end, showing the year's average temperature anomoly, calculated in August of that same year! ‡ the 2013-12-31 and most subsequent data files were manually downloaded, because GISS had configured their web server to block access by archiving tools like webcitation. (They were also blocking archive.org, but as of June 2014 they've apparently ceased blocking it.) Wget also appeared to cease working, but that turned out to be because they now require the HTTP/1.1 protocol, which old versions of wget didn't support. After I upgraded my copy of Wget to version 1.16, it worked for about a year. Then, for most of April, 2016, GISS accidentally banned access to their web site from my IP address, and I had to access it via a proxy server; they unblocked it 4/27/2016. † † In the "Sources" column (D) means from John Daly & Jerry Brennan, (A) means from archive.org, and (M) means from Stephen McIntyre. In many cases, identical files were saved on multiple dates. The dates shown in this table are the dates of the oldest known copies. For the Daly/Brennan files, only the month was recorded, but in a few cases there is reason to believe it was from near the beginning or end of the month, and in such cases I used the first or last day of the month, respectively. The dirty tricks which NASA GISS pulled to prevent archiving of this data are discussed on Tony Heller's blog site, here (and in my comments here, here and here). It is shocking. 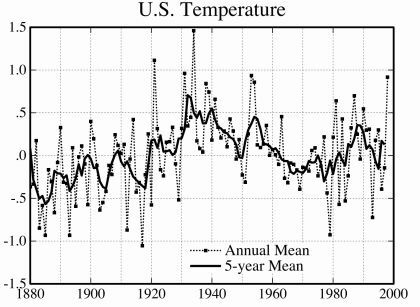 I asked the "Climate Science Rapid Response Team" to help me locate the old data, and to explain the alterations which had added so much apparent "warming" to the U.S. surface temperature record. They were unable to do so, but they did direct me to some interesting material (some of which made me queasy); see also here. For more discussion of the sources of this data, see http://sealevel.info/GISS_FigD.html. ‡ ‡ The 2007-08-?? version is probably older than the 2007-08-13 version. The confusion is due in part to the fact that GISS had two versions on their server, "Fig.D.txt" and "new.Fig.D.txt," but archive.org never saved any copies of new.Fig.D.txt.